Anas yousef Alharbi, Abdulrahman Sulaiman Alhazmi, Maged Abdullah Aljabri, Omar mohammed Alawaji, Mohammed khaled Almolhis. Background: Delay in seeking medical care has many negative effects on the patients condition and medical cost, and it reduces the potential benefits of early interventions. Delay in seeking medical care, which is affected by many factors, is a common global problem. This study aimed to study the prevalence and causes of delay in seeking medical care in Al-Madina, Saudi Arabia. Method: This research was a cross-sectional study conducted among Al-Madina population using a self-administrated questionnaire which was only administered when the inclusion and exclusion criteria for the study have been met by the participants. The questionnaire collected the demographic characteristics and information about the prevalence and the reasons of delaying in seeking medical care in Al-Madina, Saudi Arabia. Results: The study included 441 subjects out of which 61.9% were females while 38.1% were males. Seventy-eight and point two percent had university education level. Only 27.4% of participants always seek medical care as soon as they feel they need it. Delayed seeking medical care due to a financial impediment was stated by 26.1% of the subjects. Merely 25.2% had health insurance. The language was the most important criteria when choosing health service providers for 42% of patients. Severe pain forces 40.1% of participants to seek medical care, while moderate pain drives only 4.3% to seek medical care while 58.9% seek medical care when the pain or discomfort increases with time. Conclusion: There was a high prevalence of delay in seeking medical care among Al-Medina population, Saudi Arabia. Economic factors and lack of health insurance are among the main obstacles in seeking medical care. Acute pain serves as the principal reason in seeking medical care among Al- Madina population. Anas yousef Alharbi, Abdulrahman Sulaiman Alhazmi, Maged Abdullah Aljabri, Omar mohammed Alawaji, Mohammed khaled Almolhis. Prevalence and Causes of Delay in Seeking Medical Care Among Al-Madina Population, Saudi Arabia. Majmaah J Heal Sci. 2019; 7(1): 23-31. Anas yousef Alharbi, Abdulrahman Sulaiman Alhazmi, Maged Abdullah Aljabri, Omar mohammed Alawaji, Mohammed khaled Almolhis. Prevalence and Causes of Delay in Seeking Medical Care Among Al-Madina Population, Saudi Arabia. http://www.mjhs-mu.org/?mno=302644046 [Access: April 25, 2019]. Anas yousef Alharbi, Abdulrahman Sulaiman Alhazmi, Maged Abdullah Aljabri, Omar mohammed Alawaji, Mohammed khaled Almolhis. Prevalence and Causes of Delay in Seeking Medical Care Among Al-Madina Population, Saudi Arabia. Majmaah J Heal Sci. (2019), [cited April 25, 2019]; 7(1): 23-31. Anas yousef Alharbi, Abdulrahman Sulaiman Alhazmi, Maged Abdullah Aljabri, Omar mohammed Alawaji, Mohammed khaled Almolhis (2019) Prevalence and Causes of Delay in Seeking Medical Care Among Al-Madina Population, Saudi Arabia. Majmaah J Heal Sci, 7 (1), 23-31. Anas yousef Alharbi, Abdulrahman Sulaiman Alhazmi, Maged Abdullah Aljabri, Omar mohammed Alawaji, Mohammed khaled Almolhis. 2019. Prevalence and Causes of Delay in Seeking Medical Care Among Al-Madina Population, Saudi Arabia. Majmaah Journal of Health Sciences, 7 (1), 23-31. Anas yousef Alharbi, Abdulrahman Sulaiman Alhazmi, Maged Abdullah Aljabri, Omar mohammed Alawaji, Mohammed khaled Almolhis. "Prevalence and Causes of Delay in Seeking Medical Care Among Al-Madina Population, Saudi Arabia." Majmaah Journal of Health Sciences 7 (2019), 23-31. Anas yousef Alharbi, Abdulrahman Sulaiman Alhazmi, Maged Abdullah Aljabri, Omar mohammed Alawaji, Mohammed khaled Almolhis. "Prevalence and Causes of Delay in Seeking Medical Care Among Al-Madina Population, Saudi Arabia." 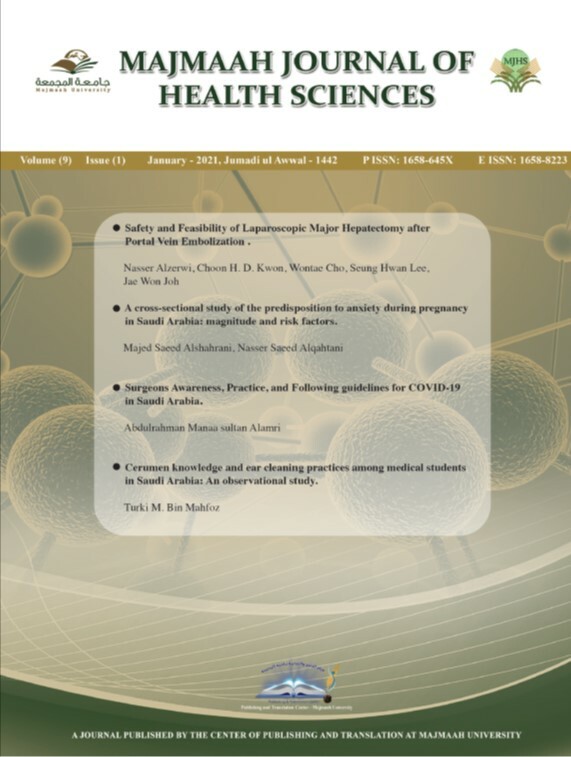 Majmaah Journal of Health Sciences 7.1 (2019), 23-31. Print. Anas yousef Alharbi, Abdulrahman Sulaiman Alhazmi, Maged Abdullah Aljabri, Omar mohammed Alawaji, Mohammed khaled Almolhis (2019) Prevalence and Causes of Delay in Seeking Medical Care Among Al-Madina Population, Saudi Arabia. Majmaah Journal of Health Sciences, 7 (1), 23-31. Majmaah J Heal Sci. Year: 2019, Volume: 7, Issue: 1: 23-31.